I can’t claim to be a lifelong soccer fan, but as someone who began following the sport with a convert’s fervor in the past few years, I’ve come to rely on coverage from The Times Online for my footy fix. The London newspaper provides exhaustive coverage of the game that not only satisfies fanatics but that novices should find accessible as well. 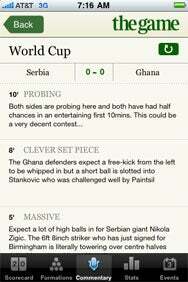 News of the World: The Game—World Cup Edition delivers great content from The Times to your iPhone, but only in a portrait view. Just in time for the World Cup, Times Newspapers has rushed out a mobile version of its soccer coverage. The Game—World Cup Edition delivers the strong content you’d expect from The Times. Unfortunately, with the first version of this $4 app, the delivery is a little lackluster. I confess I didn’t get much use out of the Webchat tab, which seems to collect the transcripts of online chats with The Times writers. There’s no list of upcoming chats and no use of push notifications to alert you if a chat is beginning, so it’s hard for me to see the value of including this in the app. The Matchcentre tab is extremely valuable, however, now that the World Cup is underway. In this tab, you’ll find scores, group tables, and stats. The app tracks matches in progress, with updated scores, stats, and lineups. A Commentary tab within in-progress matches provides minute-by-minute updates, if you’re looking for more details than just the score. The Stats tab within in-progress games could use a splash of color to help differentiate which stats belong to which team. But overall, the Matchcentre tab is an invaluable part of The Game app—perfect for following the World Cup action if you can’t get to a television. Up To the Minute: If you can’t catch the games on television, the live minute-by-minute reports in The Game app can keep you updated on the action. As mentioned above, the App Store screenshots suggest that podcasts make up a component of The Game, as did promotions for the app. But the Podcasts tab is, as noted, MIA. The News section does include articles that refer to newly posted podcasts, but the “Download the full podcast here” link in the article’s text doesn’t work within the mobile app. It’s easy enough to subscribe to the outstanding Game Podcast, but mobile apps—particularly paid ones—shouldn’t promise what they can’t deliver. The writing and match-in-progress features for The Game—World Cup Edition should impress soccer fans, maybe even enough to overlook the app’s shortcomings. But considering that the app will only be updated for the duration of the World Cup, it’s harder to forgive a not-fully-baked effort. 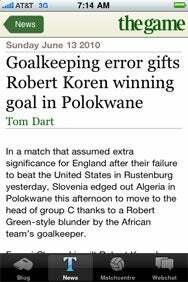 The World Cup only happens every four years; it’s a shame that The Times didn’t make sure this offering was fully ready for South Africa. Update: On June 14—a day after this review was first posted and several days after the start of the World Cup—the 1.1 update to the app introduced the promised podcast feature. The newly added tab lets you listen to daily podcasts directly from within the app. (If you get a phone call during the middle of the podcast, though, you’ll lose your place and have to start from the beginning, so there’s still something to be said for subscribing directly to the podcast.) As this addition addresses one of my major complaints about the initial release, I've adjusted my mouse rating upward. I still think the presentation in The Game—World Cup Edition leaves a little something to be desired, but at least the app delivers on the features it promises with the 1.1 update.